DECEMBER 21: TOTAL LUNAR ECLIPSE, 7.13 pm, Eastern Australia Summer Time. Here are two sky-scapes of this event. The top one shows the Moon rising at around 8 pm, looking East-North-East, and the bottom one is from the same angle but taken half an hour later, around 8.30 pm. Notice the reddish-rusty look of the Earth shadow over the Moon. DECEMBER 17 to 24: the URSIDS METEORS SHOWER will occurs instead between December 17 and 24, with the peak on December 22. This is a less spectacular shower, with about 9, 10 meteors expected per hour, at peak. 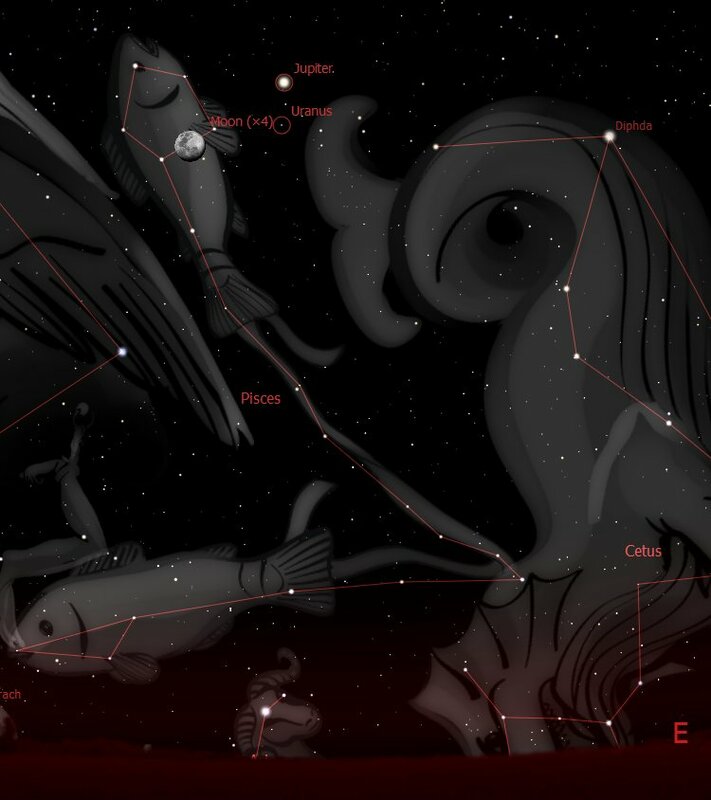 The shooting stars will appear to emanate from the constellation Ursa Minor, home to Polaris in the north. Because of their location the Ursids are not really visible from our Southern Hemisphere. DECEMBER 6 TO 19: the GEMINIDS METEORS SHOWER will have its annual occurrence between December 6 and 19, with the period of high visibility and frequency around December 13 and 14. This is considered by many the best Meteors’ Shower of the year. It is known to produce 60 to 80 multi-coloured meteors per hour, at its peak. From locations away from artificial light there could be up to 120 meteors per hours! 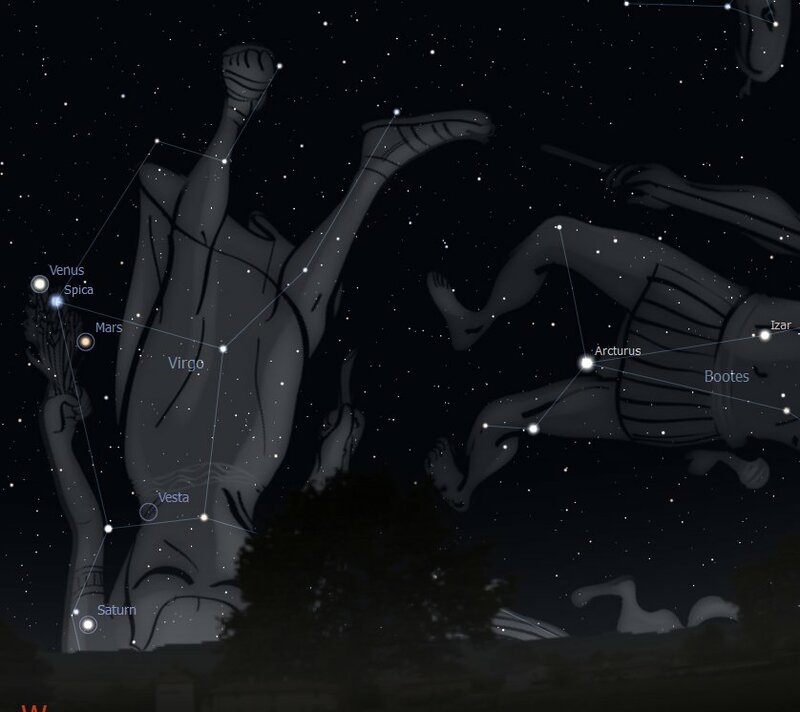 DECEMBER 14: the Waxing Moon is moving parallel to Jupiter (and invisible Uranus) tonight. The sky scape below was taken around 10.30 pm, high in the North-West. 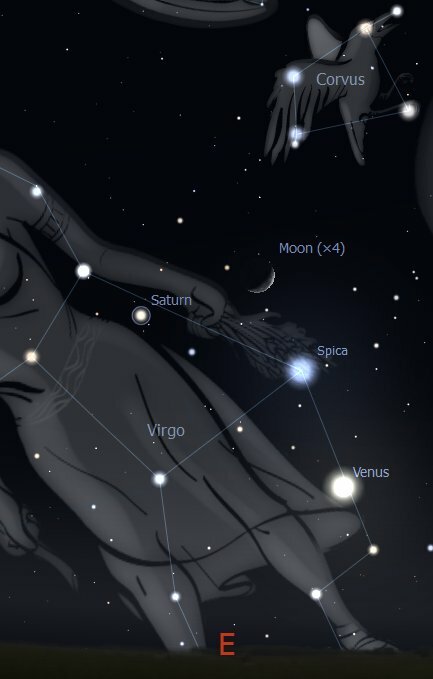 DECEMBER 2: the Waning Moon can be seen well (weather permitting), together with Venus, Saturn and Spica, brightest star of Virgo Constellation. The sky-scape below was taken around 4.30 am, looking toward the East. DECEMBER 1: the Waning Moon can be observed close to Saturn (around 8 degrees), early in the morning, before sunrise. Venus can be seen also, lower on the horizon at this time. The snapshot below was taken at 4.30 am, looking East. 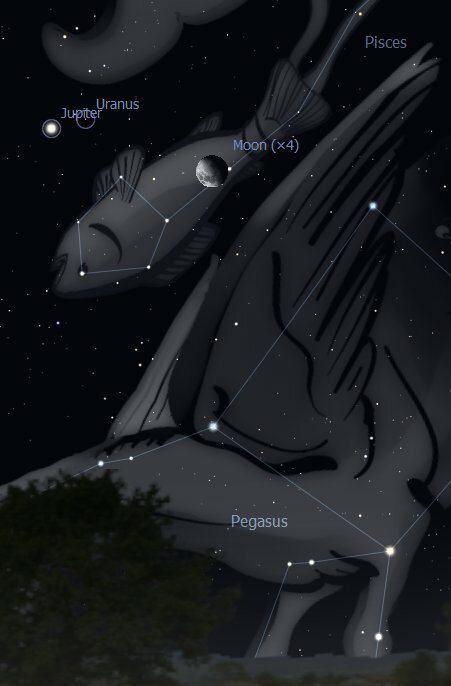 NOVEMBER 16: the Waxing Moon (between First Quarter and Gibbous) can be observed very close to bright Jupiter (and Uranus if you have a pair of very good binoculars or a telescope. The snapshot below was taken at around 8.30 pm, looking nearly overhead, toward the North-East. NOVEMBER 8: a tiny Crescent Moon can be observed close to Mars, low on the western Horizon, after sunset. This snapshot was taken on November 8, around 7.30 pm, looking west. 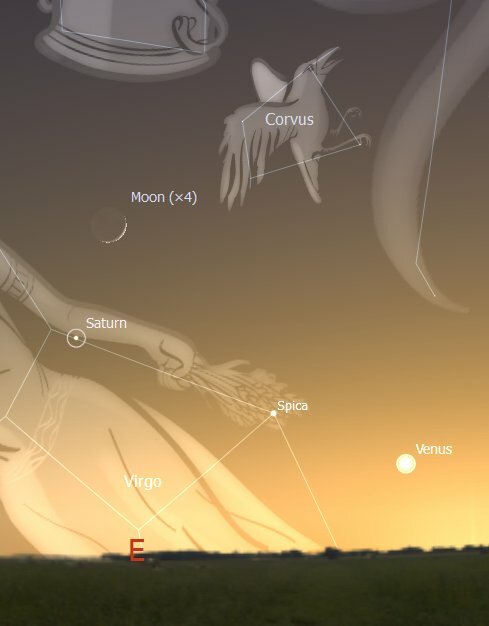 NOVEMBER 4: Venus can be observed rising before the Sun (Heliacal Rising or Morning Star apparition) for the first time after her Inferior Conjunction with the Sun. The sky-scape below was taken around 5.40 am, looking toward the East. Note the tiny Balsamic Moon, close to New Moon. And Saturn, also rising before the Sun now. 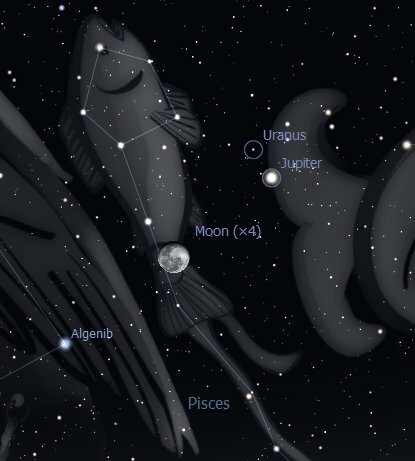 OCTOBER 20: the near Full Moon can be seen conjunct bright Jupiter and invisible Uranus. The snapshot below was taken around 7.50 pm, looking East. 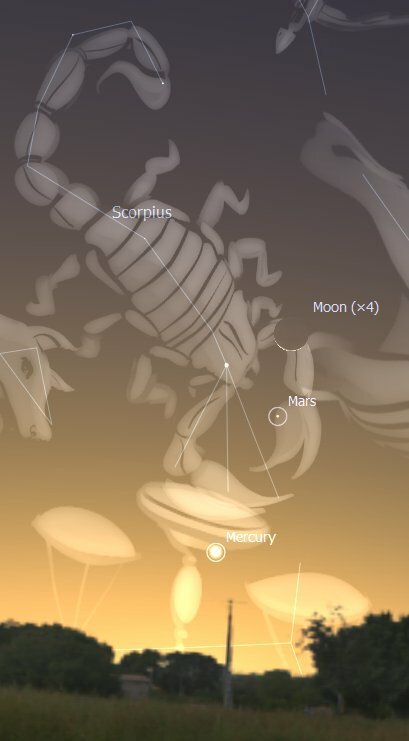 OCTOBER 11: the Waxing Crescent Moon can be seen cradled tonight between the starry claws of the Scorpion. The snapshot below was taken around 8 pm looking toward the South West. OCTOBER 10: the Moon appears for the first time in her new cycle at the same time and place as Venus and Mars, against the backdrop of the Scales Constellation (Libra) but in the Tropical or Seasonal Sign of Scorpio. 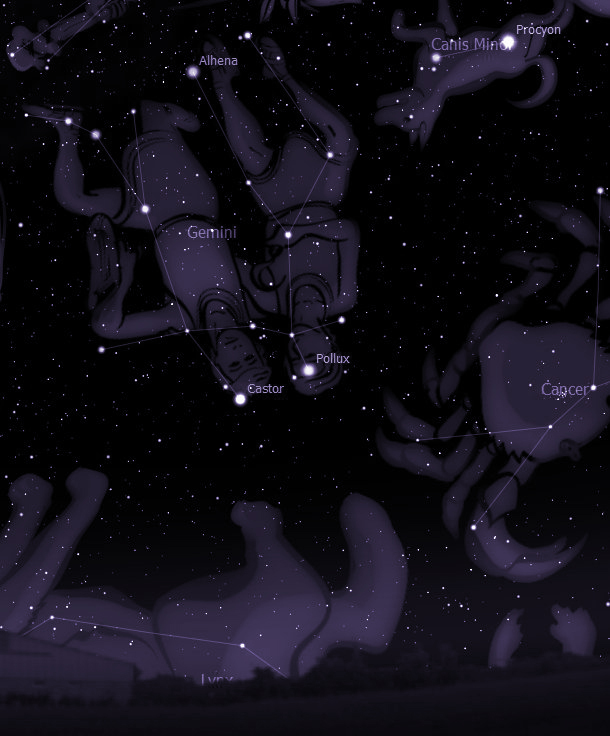 Here is an image of this event, the sky scape taken around 8.15 pm (NSW Day Light Saving). I added some major Stars’ names this time to stress the conjunction of Mars to the alpha star of Libra, Zuben Elgenubi, symbolizing the most difficult side of social reform, but also the most positive. The lively debate (Mars) raging at the moment about the Murray-Darling Water Allotment and Usage comes to mind. It could become an outright War (extreme expression of Mars) against this social reform. Difficult choices (Libra), positive outcomes, so this Libra Star tells us. Mars is transiting the more war-like of the Water Signs, Scorpio, and so is Venus who is going to be retrograde and then direct again through this Sign, on and off, until early 2011. OCTOBER 7: Venus and Mars appear very close tonight (their exact conjunction in longitude occurred on October 4). The sky-scape below was taken on October 7, around 8 pm, looking toward the West. 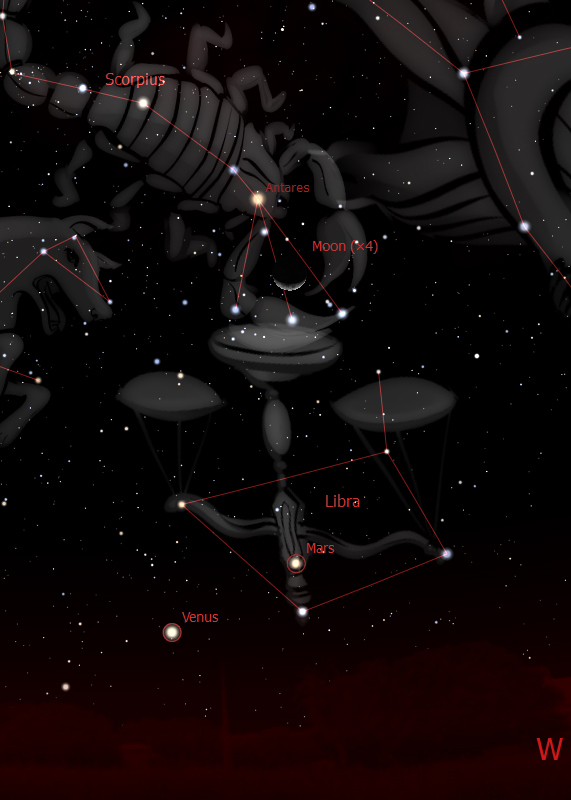 Notice Mars’ close conjunction (less than a degree) to Zuben Elgenubi, alpha Star of the Scales Constellation. SEPTEMBER 23: Just around sunset the Full Moon can be observed rising in the East very close to brilliant Jupiter tonight. The sky scape below was taken a bit after, around 7 pm. Notice invisible Uranus close to Jupiter. With a pair of good binoculars this far away planet can also be spotted, a green-bluish star like object, very close to giant Jupiter. 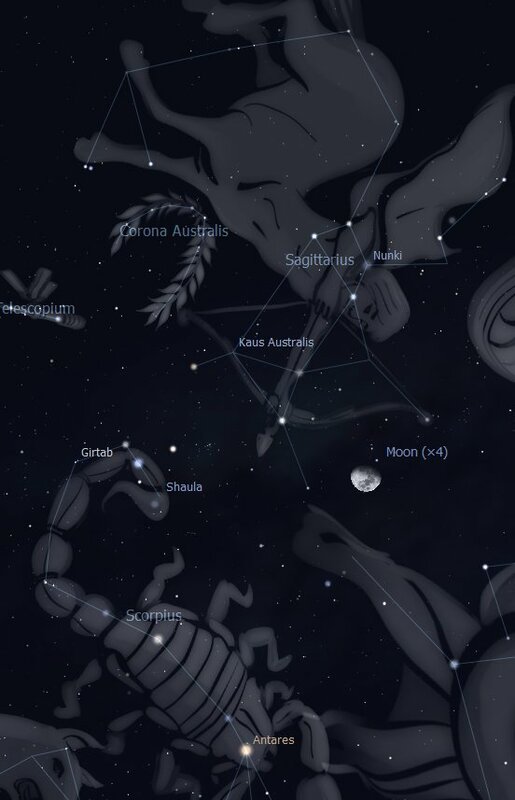 SEPTEMBER 14: One of the closest encounter for the Moon this month, the Crescent passing very close to Antares, alpha star of Scorpio Constellation, a brassy red, misteriously glowing wonderful star, one of the four Royal Stars of Persia, guarding over the four corners of the universe. 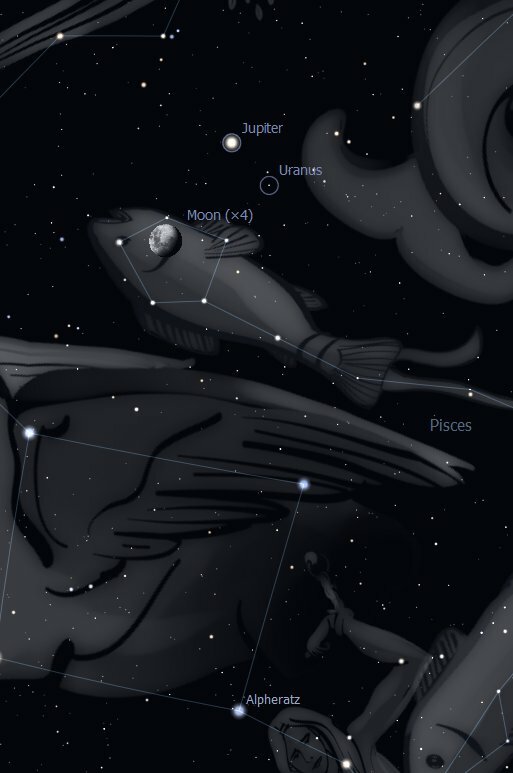 We should remember that the Moon is actually transiting the Tropical Sign of Sagittarius. 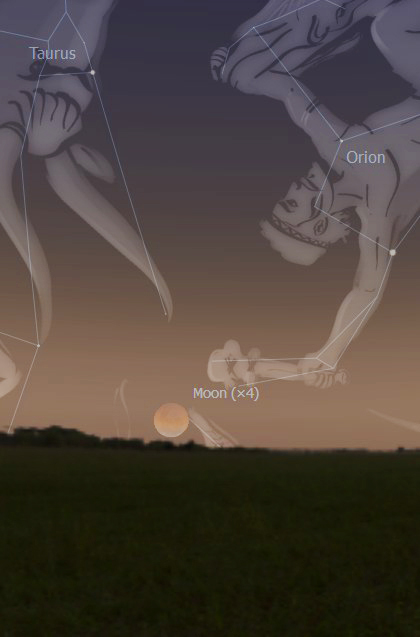 The snapshot below was taken at around 8.30 pm, looking toward the West, can’t miss it (unless it’s cloudy!). SEPTEMBER 11: Weather permitting tonight we should be able to observe the Crescent Moon very close to Venus, Mars and Spica. If you have a low horizon you could also spot Saturn setting below this group. The sky scape below was taken just after sunset, around 6.30 pm, looking toward the West. 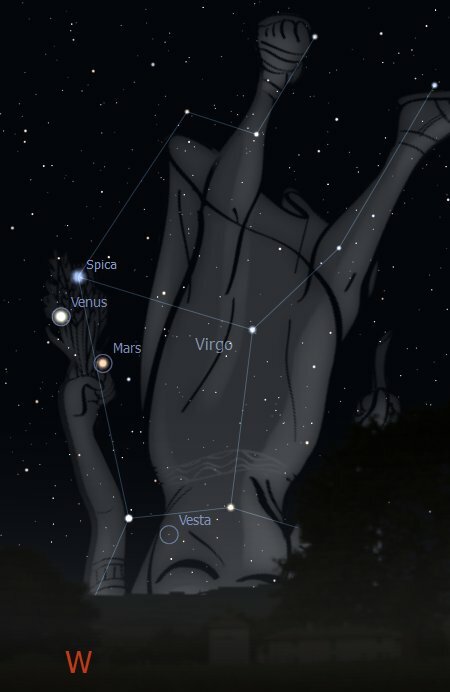 SEPTEMBER 4 and 5: Venus and Mars appear very close to each other and Spica, alpha star of Constellation Virgo. 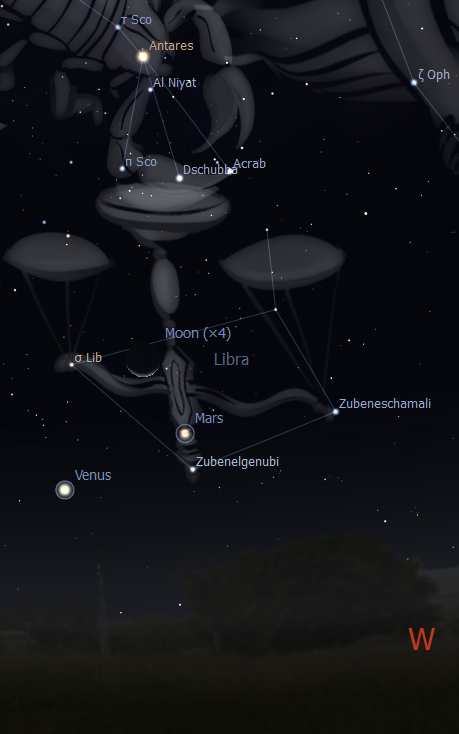 In this snapshot, taken just before 7 pm, we can also see Saturn setting (only if you have a fairly low horizon). Saturn will disappear completely in the glare of the Sun by the end of September. It will re-appear as a Morning Star about a month after that. 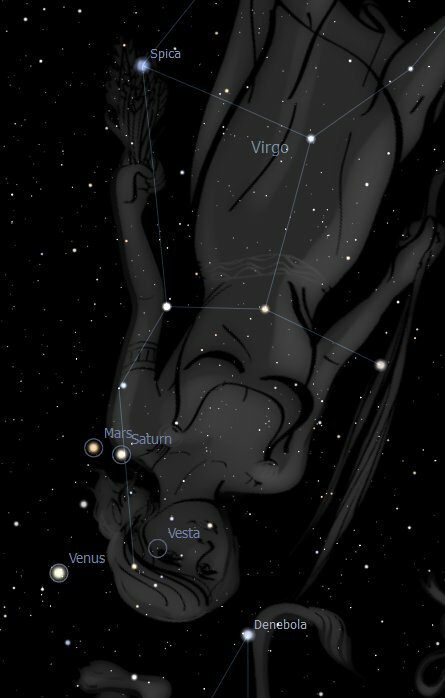 SEPTEMBER 1, 2, 3: bright Venus can be observed now very close to Spica, alpha star of Constellation Virgo. Underneath Venus and Spica reddish Mars is also easily spotted. This sky scape was taken at around 7 pm on September 2. In the picture we can also see Saturn, now well below Mars and close to setting, and on to the North beautiful Arcturus, alpha star of Bootes, the Herdsman Constellation. This is the third brightest star in the heavens, second only to Sirius and Canopus. 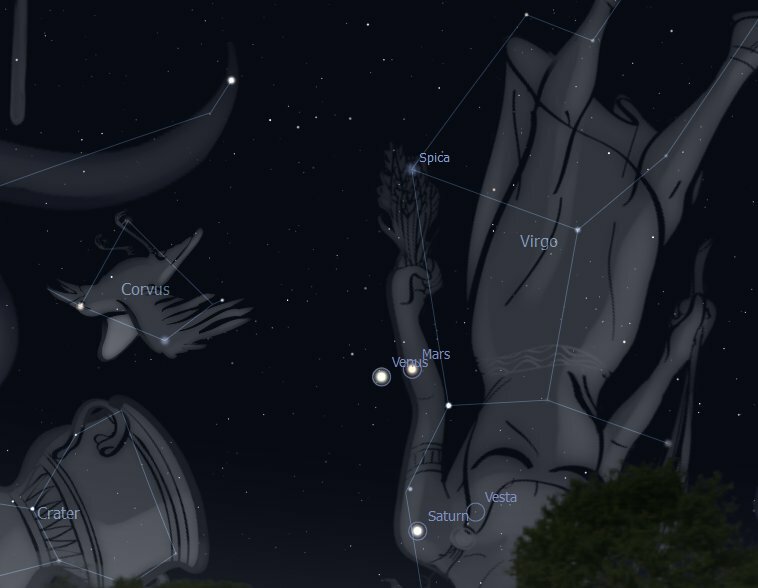 AUGUST 29: Venus and Mars can be seen close to the alpha star of Constellation Virgo, Spica, the ear of corn in the hand of the celestial maiden. This snapshot was taken around 6.30 pm, looking toward the West. 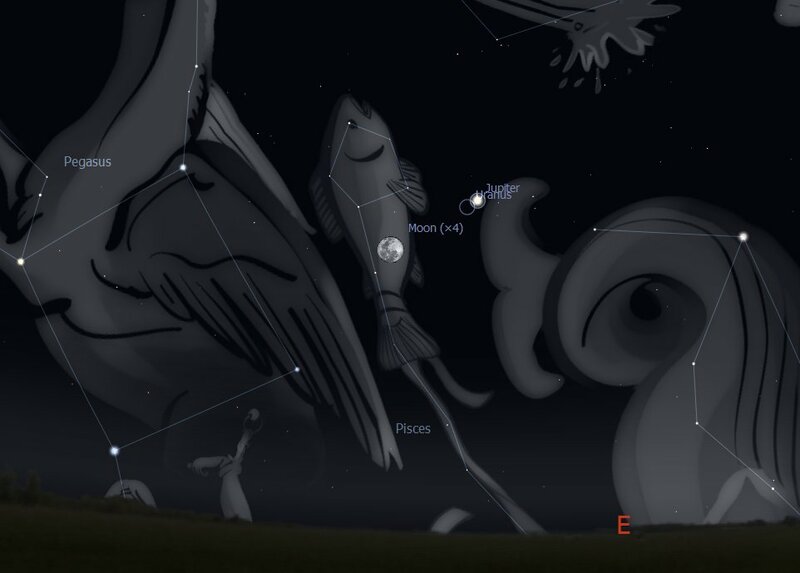 AUGUST 27: the waning Moon can be observed rising in Jupiter’s company. The sky scape below was taken around 9.30 pm, looking toward the East. 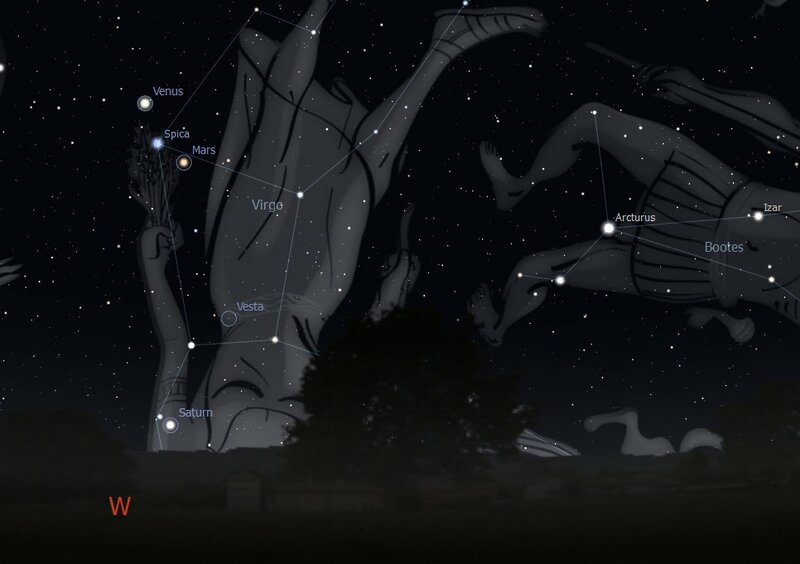 AUGUST 19: Great night to spot the constellation of Sagittarius, while the Quarter waxing Moon is cradled between the lower stars of this Constellation, in particular close to Kaus Australis, the Southern Bow as it is traditionally called, the star at the base of the archer’s bow. The sky scape below was taken around 11.30 pm, looking toward the West. This spectacle will be visible higher in the sky since after sunset, of course, because the Moon rises around midday and sets after 2 am. 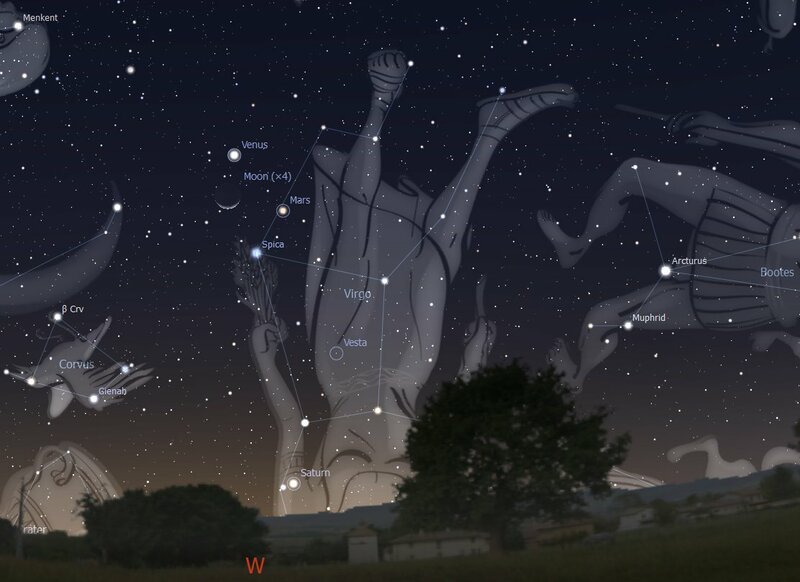 AUGUST 18: tonight and in the next few nights we can observe splendid Venus really close to Mars, the conjunction in longitude becoming exact on August 21. The sky scape below was taken around 7.30 pm, looking toward the North-West. 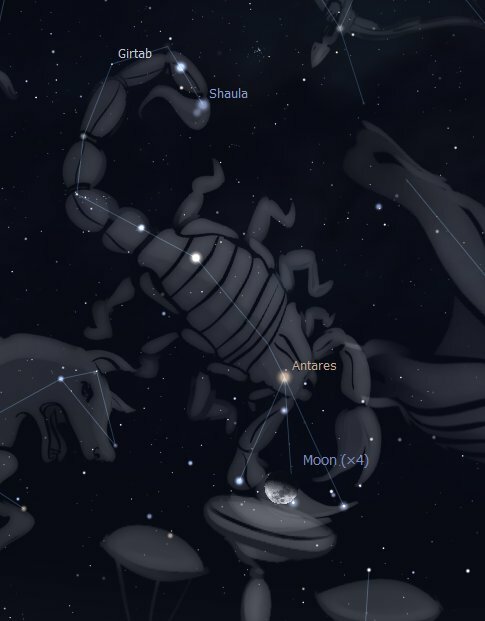 AUGUST 17: The First Quarter Moon can be observed close to Antares, alpha star of Constellation Scorpio. The snapshot below was taken looking toward the West around 11.30 pm. 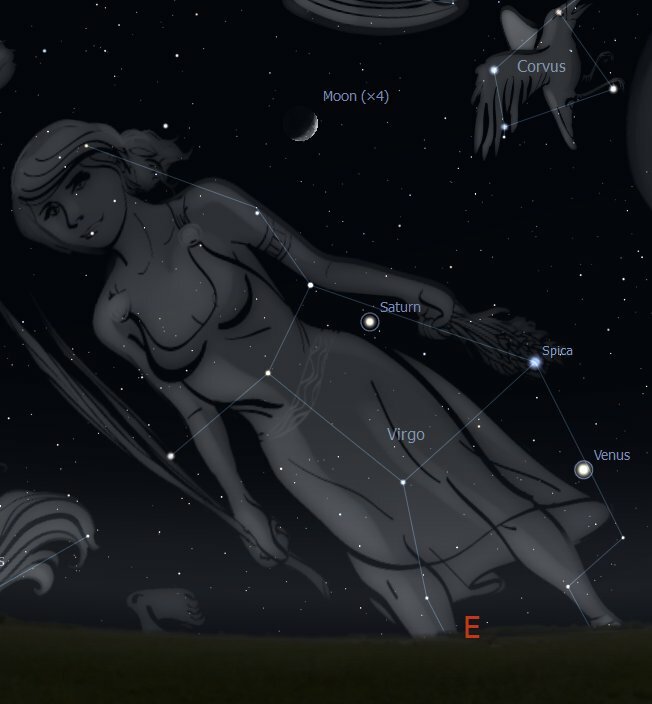 AUGUST 14 and 15: the Crescent Moon can be seen close to the alpha star of Virgo, Spica, the ear of corn in the hand of the maiden. The snapshot below was taken on the 14th, around 6.30 pm, looking toward the North West. 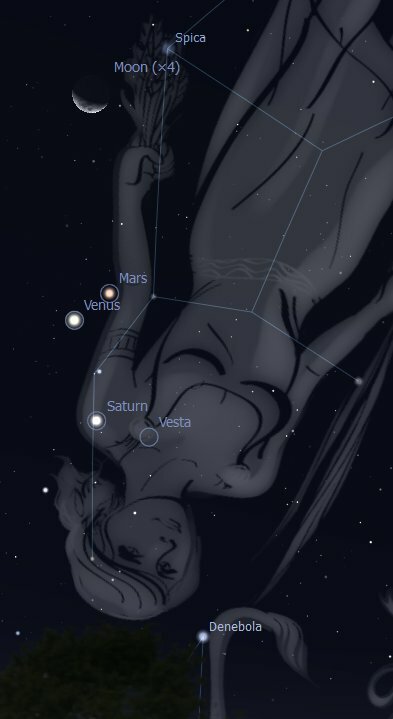 AUGUST 13: the Crescent Moon can be observed very close to Venus and Mars and just above Saturn from which the other two are now separating. The sky scape below was taken around 6.30 pm, looking toward the West. 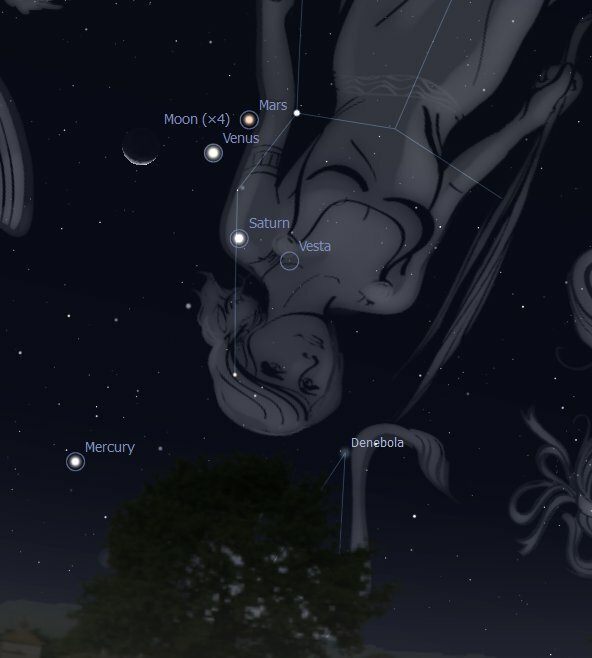 AUGUST 12: the tiny crescent Moon can be observed close to Mercury in the early evening, looking toward the west as it gets dark. This is the part of the sky most rewarding for spotting planets at present. 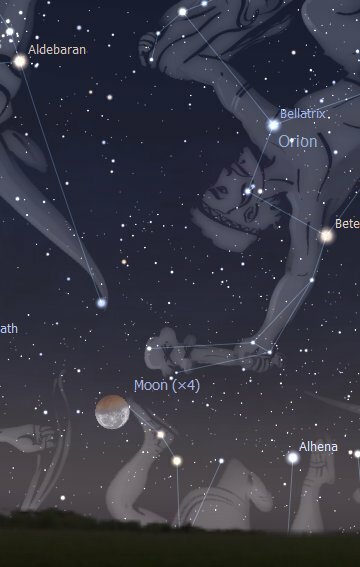 As you can see from the snapshot below above the Moon-Mercury conjunction can be seen bright Venus separating from yellowish Saturn (the conjunction was exact on August 9) and applying to red Mars that she will reach on August 21. 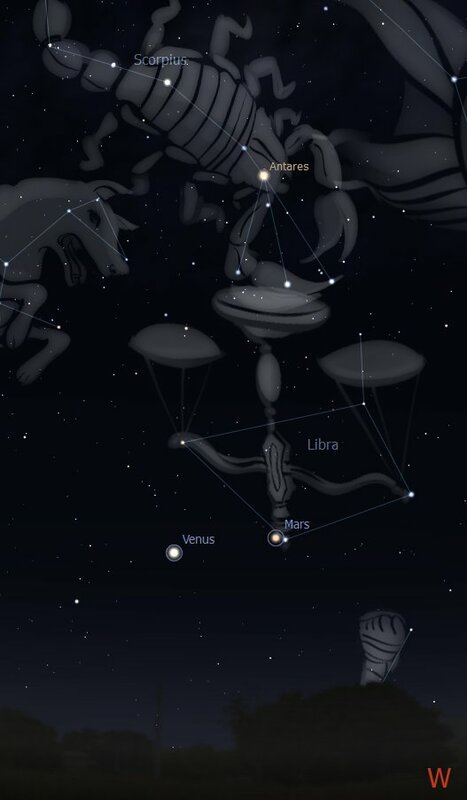 From today to August 14 the Moon, growing a little every night, will climb the sky to conjunct in turn Saturn, Venus, Mars and Spica (alpha star of Virgo Constellation), a spectacle not to be missed, weather permitting. 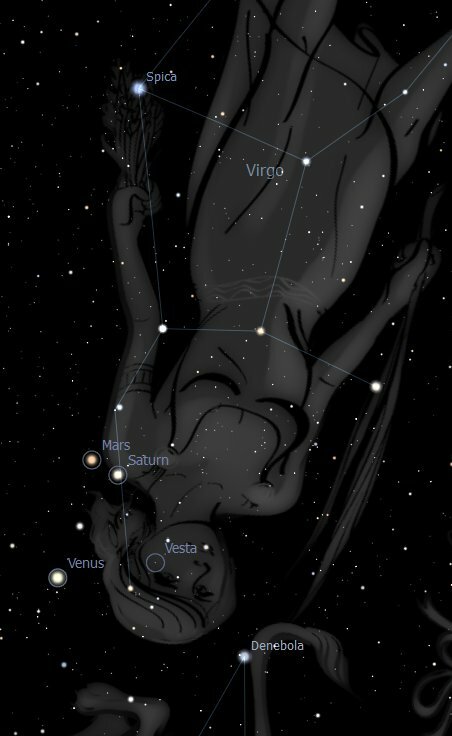 AUGUST 7, 8, 9 and beyond:Venus is getting closer and closer to Saturn,becoming conjunct in longitude on August 9, 3.23 am. This is a great and rare enough spectacle, worth observing. Venus is now very bright (4.6 magnitude), close to her maximum elongation (distance) from the Sun on August 19. 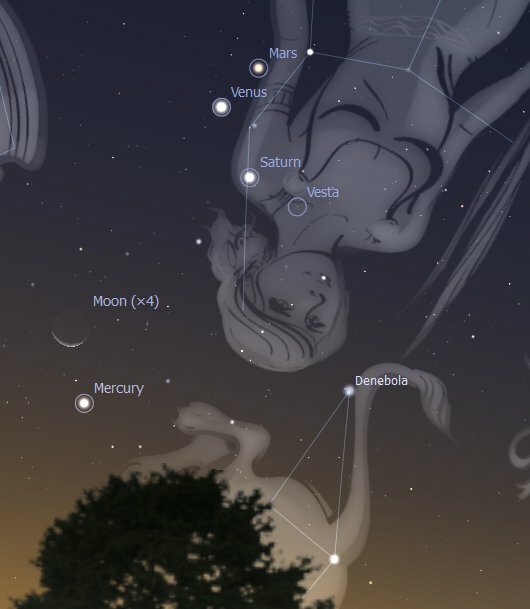 The cosmic trio will remain close until mid-August, while Venus and Mars will go on performing their duet until mid-October, ideal time to observe them. The sky scape below was taken at around 7 pm looking toward the West. 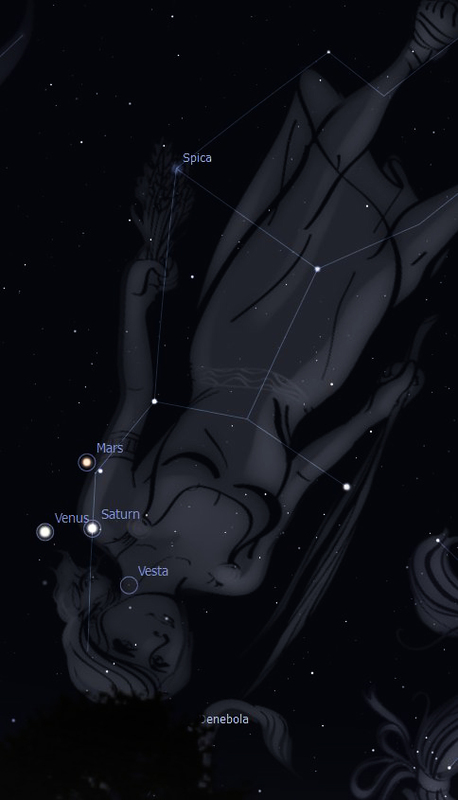 AUGUST 1: Mars and Saturn are still conjunct, only a couple of degrees apart. In the next few nights we will be able to observe Mars slowly separating from Saturn while luminous Venus edge closer to both. This sky scape was taken looking toward the west around 6.30 pm. The three can be seen against the backdrop of Virgo Constellation. This snapshot was taken at around 6.30 pm, looking toward the North-West.